Will Bridgewater unleash Terminator-like alpha-bots? The unit will create trading algorithms that make predictions based on historical data and statistical probabilities, said the person, who asked not to be identified because the information is private. The programs will learn as markets change and adapt to new information, as opposed to those that follow static instructions. A spokeswoman for Westport, Connecticut-based Bridgewater declined to comment on the team. I have much respect for Bridgewater and AI applications, but this latest initiative is unlikely to unleash an army of Terminator-like robots that relentlessly seek out alpha in the investment business. People: Who are they? What are their pedigrees? What is their experience, legal and regulatory history, etc. Performance: What are the returns? What is the risk profile, etc. Philosophy: Why do you think you have an alpha? What distinguishes you from the other managers? Process: How do you implement your stated investment philosophy? Portfolio (optional): Does your portfolio reflect what you said about your investment philosophy and process? The problem with AI systems that learn from past history and its mistakes is that they are notoriously difficult to debug. When something goes haywire, it becomes virtually impossible to walk back the steps that led to the misstep. Was the bad decision a bug, or a feature? It is very difficult to tell. In the framework of the Ps, it becomes very difficult to have confidence in a investment process where you have no idea of what is going on, other than the fact that it is a black box. That is why AI systems are unlikely to be in widespread use - few institutional sponsors will trust them. In the absence of widespread adoption, we are unlikely to see a future army of AI-bots rooting out alpha. The idea is that non-linear systems can be highly interconnected, but initial condition dependent. In one moment, a butterfly flapping its wings could conceivably cause weather havoc on the other side of the world, but in another, nothing would happen. One example of a principle that is initial condition dependent is Elliot Wave Theory, which is a charting technique known well to technical analysts. The interpretation of a chart can be highly dependent on how the analyst begins his wave count and different starting points can lead to very different conclusions (one reason why I've never understood EW very well). A number of years ago, I spoke to the head of a large quantitative investment firm in Boston and their firm had done extensive work in non-linear systems. They had some success with it, but abandoned it after discovering that the risk-adjusted alpha that it generated was roughly in line with traditional linear factors such as the value, growth and momentum. These systems were just too difficult to control and diagnose, especially if investment results turned negative. Is this the time to be jumping into European equities? Not so fast! After giving the matter some thought, I came to a contrary conclusion of targeting the bulk of an investor`s equity exposure to the US and Asia X-Japan. 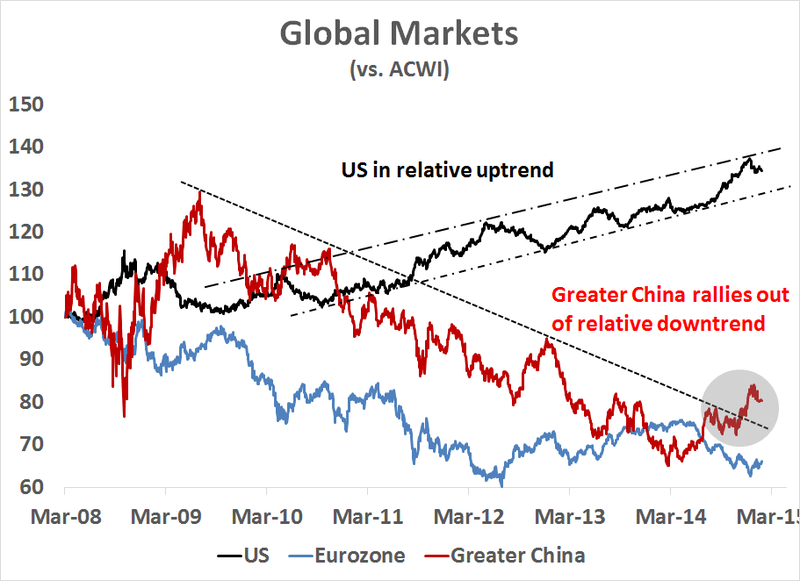 Here is a chart of the relative returns of the US (SPY), Europe (FEZ) and Greater China (equal weighted FXI, EWH, EWT, EWY) relative to the MSCI All-Country World Index (ACWI). These relative returns are useful in that they all use ETFs trading in USD so there are no currency effects. As the chart shows, the US market has been in a steady relative uptrend against global stocks since 2010 and there is no technical sign that that relative uptrend is likely to be broken. 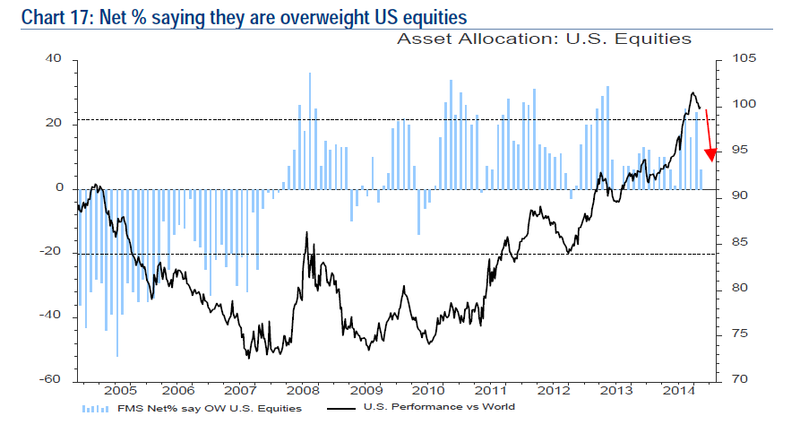 Further, the latest BoAML shows that institutional managers have pulled back from their US weights and they are roughly neutrally weighted in US stocks, which can give them more room to run. 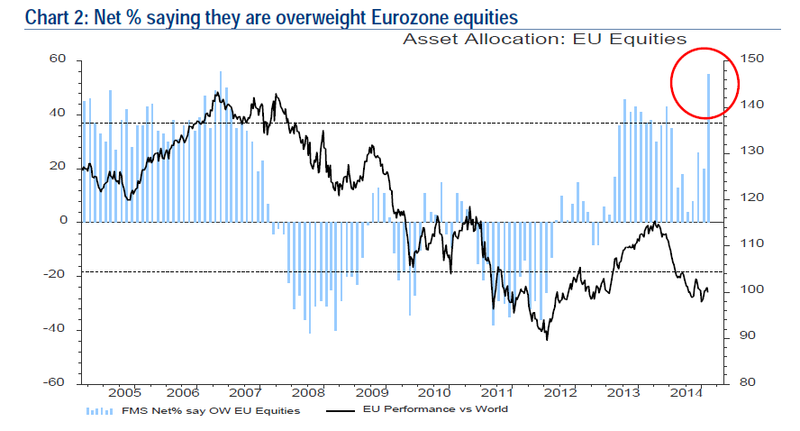 By contrast, institutions are highly overweight eurozone equities, which makes the contrarian more cautious about this region. Expectations are running high for the eurozone. 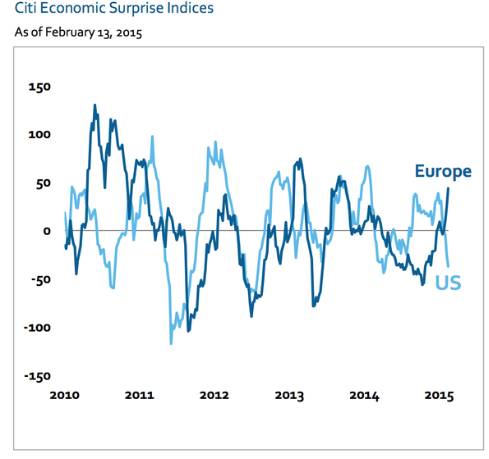 This discrepancy has led to a spike in earnings growth expectations for European equities. Wow, talk about heightened expectations for Europe! One wrong step and managers could all rush for the exit. By contrast, Greater China (China, Hong Kong, South Korea, Taiwan) is starting to show a turnaround in relative performance. By way of explanation, I constructed the Greater China ETF basket is a useful way of getting exposure to China and its major Asian trading partners.This basket rallied through a multi-year relative downtrend and seems to be on its way to better relative returns. 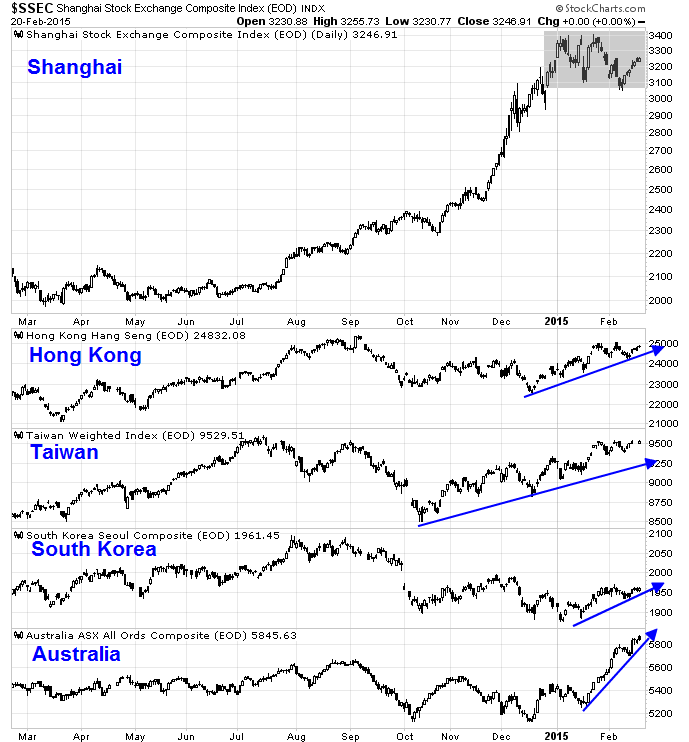 I had also highlighted the constructive chart patterns of the stock markets of China's Asian trading partners in my recent post (The 2011 pattern continues). 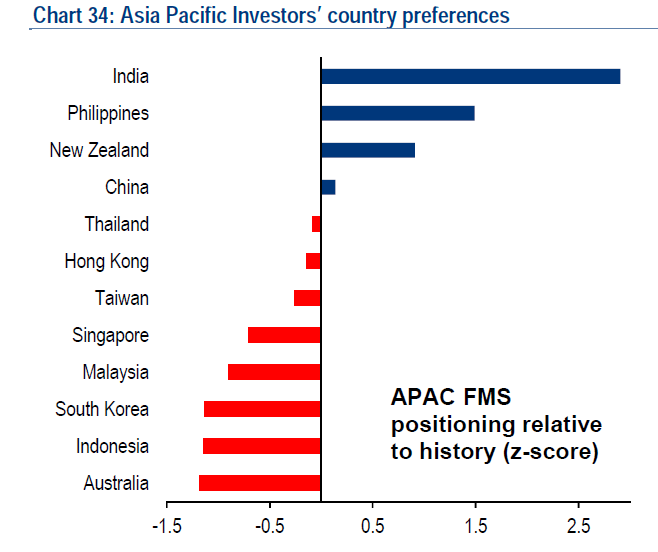 If we were to just focus in on Asia xJapan equity allocations as reported by the BoAML Fund Manager Survey, the greatest overweights are India, the Philippines and New Zealand, which indicates a possible contrarian long position in the Greater China theme. When I first focused on the question of regional equity allocation, my first instinct was to think about the eurozone. 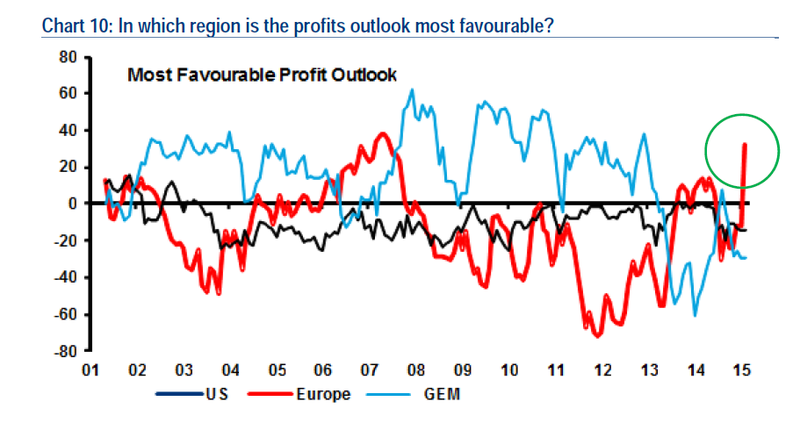 Upon further study, the excessive optimism about the eurozone was a surprise to me. My conclusion is to tilt the weight of the equity portion of a portfolio towards the US and Asia xJapan. Will Janet Yellen reflect the views of "many participants"? When Fed Chair Janet Yellen's testifies before Congress starting Tuesday, she is likely to say that a June hike is still on the table, though not a done deal. To better understand the gulf between Federal Reserve expectations and market expectations, I scanned the last FOMC minutes for the phrase "many participants" to better get a big picture of the Fed`s consensus view of monetary policy. My analysis is based on the interpretation that the "many participants" phrase is more or less representative of the consensus on the FOMC. First, there was much discussion over the use of RPP for the process of monetary policy normalization, which I won't quote as they do not pertain to the timing of rate hikes, which is what the market is mostly focused on. Many participants continued to judge that a deterioration in the foreign economic situation could pose downside risks to the outlook for U.S. economic growth. Several saw those risks as having diminished over the intermeeting period, with lower oil prices and actions of foreign central banks both being supportive of growth abroad, but others pointed to heightened geopolitical and other risks. Many participants indicated that their assessment of the balance of risks associated with the timing of the beginning of policy normalization had inclined them toward keeping the federal funds rate at its effective lower bound for a longer time. Some observed that, even with these risks taken into consideration, the federal funds rate may have already been kept at its lower bound for a sufficient length of time, and that it might be appropriate to begin policy firming in the near term. In connection with the risks associated with an early start to policy normalization, many participants observed that a premature increase in rates might damp the apparent solid recovery in real activity and labor market conditions, undermining progress toward the Committee's objectives of maximum employment and 2 percent inflation. In addition, an earlier tightening would increase the likelihood that the Committee might be forced by adverse economic outcomes to return the federal funds rate to its effective lower bound. Some participants noted the communications challenges associated with the prospect of commencing policy tightening at a time when inflation could be running well below 2 percent, and a few expressed concern that in some circumstances the public could come to question the credibility of the Committee's 2 percent goal. Indeed, one participant recommended that, in light of the outlook for inflation, the Committee consider ways to use its tools to provide more, not less, accommodation. Participants discussed the economic conditions that they anticipate will prevail at the time they expect it will be appropriate to begin normalizing policy. There was wide agreement that it would be difficult to specify in advance an exhaustive list of economic indicators and the values that these indicators would need to take. Nonetheless, a number of participants suggested that they would need to see further improvement in labor market conditions and data pointing to continued growth in real activity at a pace sufficient to support additional labor market gains before beginning policy normalization. Many participants indicated that such economic conditions would help bolster their confidence in the likelihood of inflation moving toward the Committee's 2 percent objective after the transitory effects of lower energy prices and other factors dissipate. Some participants noted that their confidence in inflation returning to 2 percent would also be bolstered by stable or rising levels of core PCE inflation, or of alternative series, such as trimmed mean or median measures of inflation. A number of participants emphasized that they would need to see either an increase in market-based measures of inflation compensation or evidence that continued low readings on these measures did not constitute grounds for concern. Several participants indicated that signs of improvements in labor compensation would be an important signal, while a few others deemphasized the value of labor compensation data for judging incipient inflation pressures in light of the loose short-run empirical connection between wage and price inflation. To get a reasonably sized consensus to support a rate hike, two conditions need to be met. One is sufficient progress toward full-employment with the expectation of further progress. I think that condition has already been met. The second condition is confidence that inflation will indeed trend toward target. That condition has not been met. To meet that condition requires at least one of the following sub-conditions: Rising core-inflation, rising market-based measures of inflation compensation, or accelerating wage growth. If any were to occur before June, I suspect it would be the accelerating wage growth. Participants discussed the communications challenges associated with signaling, when it becomes appropriate to do so, that policy normalization is likely to begin relatively soon while remaining clear that the Committee's actions would depend on incoming data. Many participants regarded dropping the "patient" language in the statement, whenever that might occur, as risking a shift in market expectations for the beginning of policy firming toward an unduly narrow range of dates. As a result, some expressed the concern that financial markets might overreact, resulting in undesirably tight financial conditions. Participants discussed some possible communications by which they might further underscore the data dependency of their decision regarding when to tighten the stance of monetary policy. A number of participants noted that while forward guidance had been a very useful tool under the extraordinary conditions of recent years, as the start of normalization approaches, there would be limits to the specificity that the Committee could provide about its timing. Looking ahead, some participants highlighted the potential benefits of streamlining the Committee's postmeeting statement once normalization has begun. More broadly, it was suggested that the Committee should communicate clearly that policy decisions will be data dependent, and that unanticipated economic developments could therefore warrant a path of the federal funds rate different from that currently expected by investors or policymakers. In summary, a careful read of the FOMC minutes by distinguishing between the phrase "many participants", "some participants" and "a number of participants" can give us a better understanding of how the consensus at the Fed is developing. Indeed, the language of "many participants" is defining market expectations of Federal Reserve monetary policy. We will have to watch the tone of Janet Yellen's testimony to see how her testimony aligns with the views of "many participants". My inner trader uses the trading model component of the Trend Model seeks to answer the question, "Is the trend getting better (bullish) or worse (bearish)?" The history of actual (not backtested) signals of the trading model are shown by the arrows in the chart below. In addition, I have a trading account which uses the signals of the Trend Model. The last report card of that account can be found here. Last week, I used the 2011 stock market pattern as an analogue for the current market (see 2011 all over again?). 2011 was marked by a series of ups and downs in Europe, which resolved itself with an upside breakout sparked by initiation of the ECB's LTRO program. After over two months of rangebound choppy action we finally made all time highs on Friday. Those that have fought the recent rally can list a plethora or reasons why the recent high is bearish; however, let there be no mistake that closing at highs is bullish as it has been in every other instance since the bull market has begun. Being bullish though doesn’t necessarily equate to higher prices next week as a consolidation period is often followed by new highs. Keeping it simple though the path of least resistance is higher and for the time being any pull-backs will probably be limited and bought back up. The common element found in these patterns is that, after several weeks of choppy markets, the SPX staged an upside breakout. While the market ultimately rallied after the breakout, it spent a some time undergoing a sideways consolidation and possible pullback below the breakout. 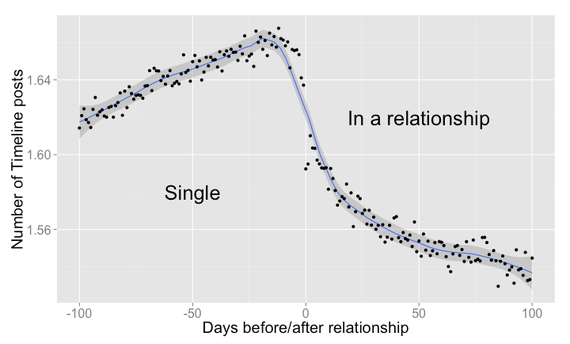 The market pattern in 2015 has fit that template almost exactly. This leads me to believe that stock prices will have a bullish bias. Regular readers know that the input to my Trend Model are global stock and commodity prices. As we take a tour around the world, we see that pretty much all of these elements are showing signs of improvement. In the US, the SPX consolidated last week and then rallied on Friday to new all-time highs. 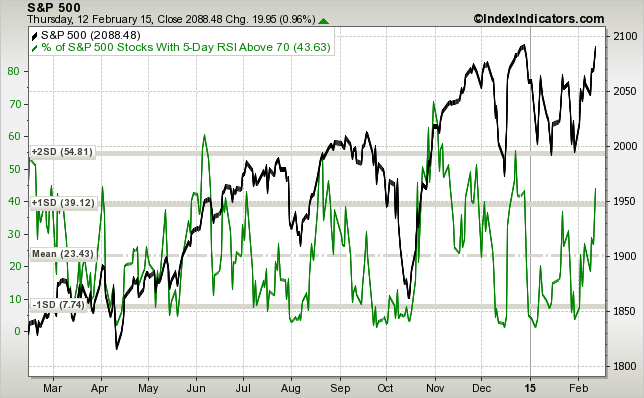 Momentum continues to be positive, as measured by the 14-day RSI, which is nearing an overbought reading - but not yet. The DJIA also blast off to a new high, though the failure of the Transports to confirm the strength of the Dow is a concern. This is something to keep an eye on given the observation from Mark Hulbert of a Dow Theory sell signal. My dashboard of Greater China markets, the stock markets of China's major Asian trading partners, are also telling a bullish story. While the Shanghai Index appears to be undergoing a high level consolidation, all of the other Asian markets are in uptrends. The commodity markets, which is an indirect measure of global and Chinese demand, seem to be stabilizing or trying to bottom. 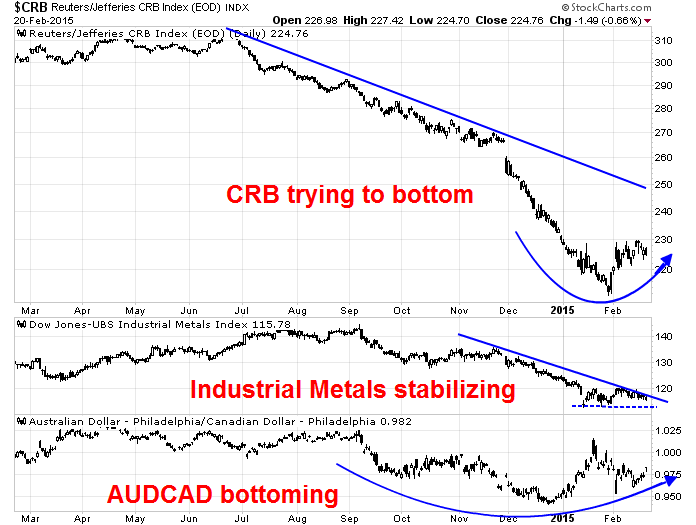 One important metric of Chinese demand, the AUDCAD cross rate because resource-heavy Australia is more sensitive to China than Canada, appears to be bottoming and starting to turn up. It seemed that the markets were becoming immune to bad news. In my last post (see Is it time to buy Greece), which was written before the announcement of the interim deal, I became more constructive on Greek stocks and bonds because I noticed that Greek paper was not reacting to bad news. It was therefore only a matter of time before positive news appeared that would spark a turnaround rally. In the US, the markets were also getting immune to bad news. The high frequency macro backdrop was becoming more negative. 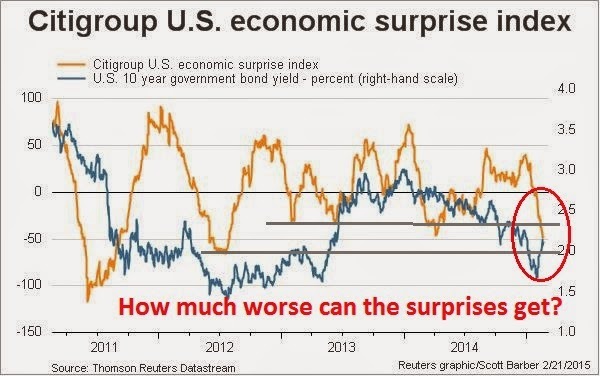 The chart below of the Citigroup US Economic Surprise Index, which measures the rates of beats and misses of macro data, shows that the Surprise Index (orange line) has tanked to levels where it has bottomed out in the past. We only need the spark of a few positive surprises to spark a rally. Among long leading indicators, yields on corporate bonds and treasuries increased slightly, reflecting an abatement of immediate deflationary concerns, but they are still positive. Money supply remains quite positive. Real estate loans, and house sales as reported by DataQuick were positive. Mortgage applications were back in negative territory again this week. The short leading indicators were mixed. Oil prices, industrial metal prices and commodities more broadly all declined slightly. Spreads between corporate bonds and treasuries also remained slightly negative. Temporary staffing and gas prices and usage remained positive, and initial jobless claims remain within a very positive range. 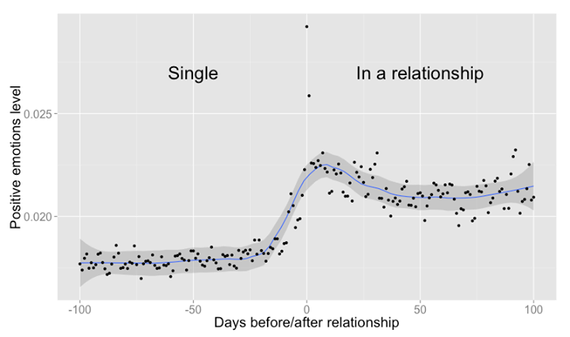 Coincident readings were much more negative. Consumer spending as measured by Gallup was negative yet again, although Johnson Redbook had a more positive week. Tax withholding, Rail, and Container shipping were all positive. On the other hand, Steel production and single hull shipping were negative. The TED spread backed off slightly, while LIBOR was slightly negative. The big negative is that we are seeing YoY negative comparisons with some of the worst readings last year. Still, with the exception of commodities, generally the long and short leading indicators are positive. The Earnings Season report from John Butters of Factset appeared to be constructive as well. 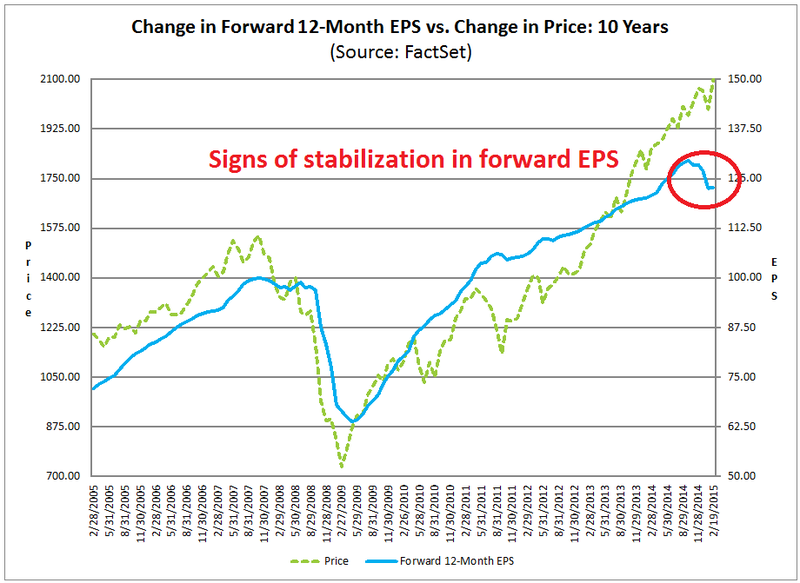 As the chart below shows, forward EPS estimates have begun to stabilize and flatten out after their big drop which began in Q4 2014. More importantly, the earnings guidance has stabilized as well. Butters reported that 69 companies showed negative guidance, compared to 15 with positive guidance this Earnings Season. The guidance score last week was 63 negative and 11 positive. That means that, in the last week, we saw 6 companies with negative guidance and 4 with positive guidance, which is a much more balanced picture than before. Under these circumstances, it may only take a minor positive catalyst such as the resolution of the West Coast port dispute, which Jon LaVorga at Deustche Bank projected to have shaved as much as 1% off GDP growth, to spark a market rally. However, I would not regard the US equity outlook as one of "up, up and away!" 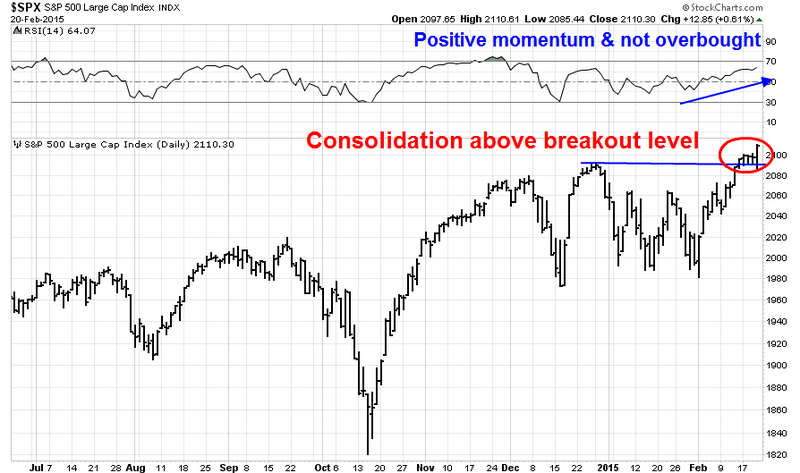 I had outlined a number of negative breadth divergences last week and those remain a concern. 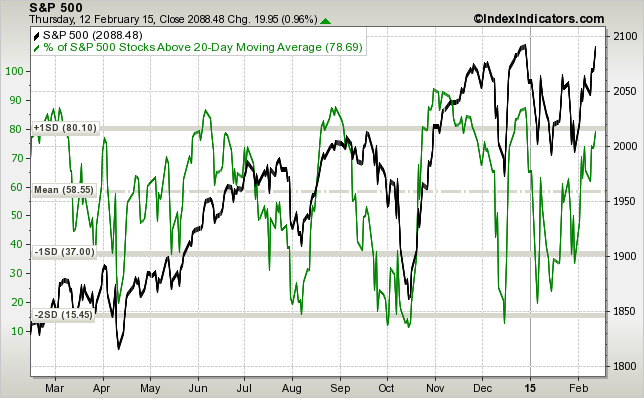 Examples include this chart of the average 14-day RSI of stocks in the SP 500 (green line) from IndexIndicators.com. 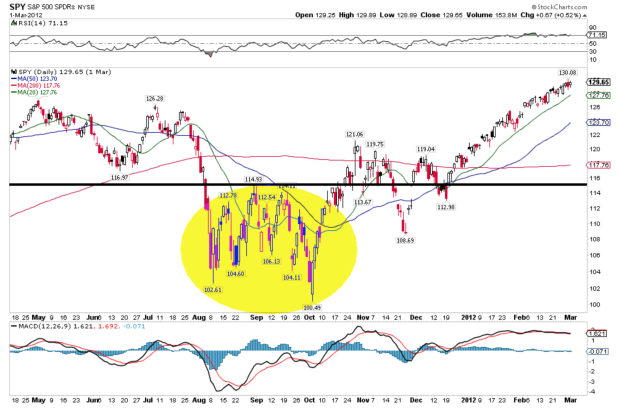 Note how the green line is tracing out a pattern of lower highs as the market (black line) has rallied. 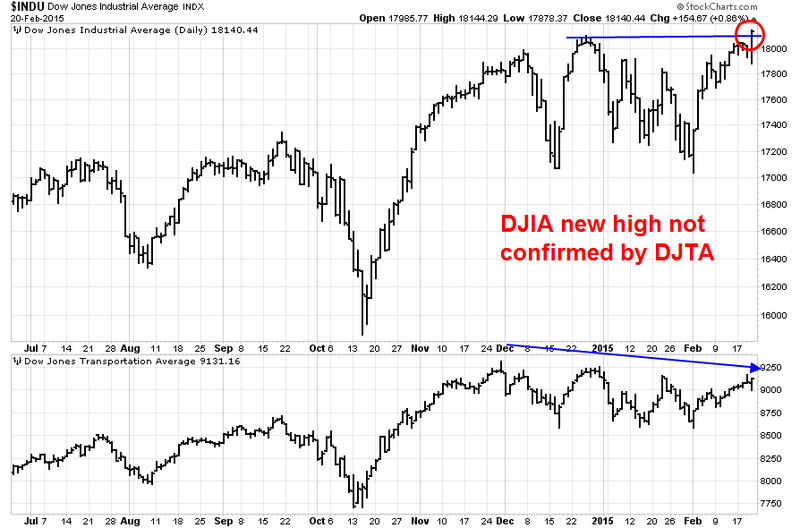 As well, Dana Lyons highlighted the fact that the NASDAQ 100 was advancing to new highs on declining breadth. Such a condition led to market weakness within a month on average. 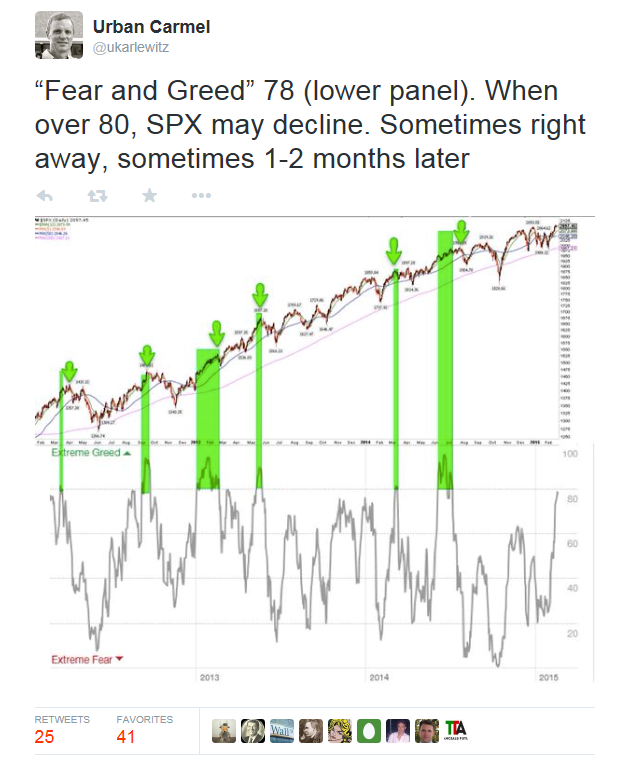 Urban Carmel also pointed out that the CNN Money Fear and Greed Index is now at 80. Such a condition can often mean corrective action within 1-2 months of the signal. These readings suggest to me that the roadmap laid out by Sassy Options is a reasonable base case scenario. My inner trader is long and he is positioned for a stock market, which may stall out in the next 1-2 weeks. One possible inflection point may be the Yellen testimony to Congress on Tuesday and Wednesday. Or it may not - that's what stop loss orders are for. My inner investors is dipping his toe back into a higher weighting in risky assets from his neutrally weighted position between stocks and bonds. Is it time to buy Greece? Germany rebuffed Greece’s request for an extension of its aid program as euro-area finance ministers prepare to meet to avert a cash crunch for the region’s most-indebted nation. The fact that the Greek proposal for a six month extension was rejected couldn't have been a surprise. The details of the proposal were already leaked on Wednesday. The terms were the same as the one that the Eurogroup had already rejected. So the official reaction should not have been a surprise. Bad news already priced in? While the euro lost 0.1 percent, Greek bonds rose, with the yield on the three-year notes down 28 basis points at 17.09 percent at 5:33 p.m. in Athens. That compares with a record 128 percent in March 2012. Greek stocks advanced for a second day, with the Athens Stock Exchange benchmark up 1.1 percent. An index of Greek debt known as the Bloomberg Greece Sovereign Bond Index also shows confidence remains well above the worst levels of pessimism during the past five years. The current value of 90.05 is five times the low of 17.45 June 1, 2012. The gauge peaked at 118.9 in August. A longer term chart of the Athens General Index and the US Greek ETF GREK also tells a similar story. Greek stocks look washed out, especially when they don't react negatively to bad news. A closer look at the 30 minute tick relative performance chart of GREK compared to FEZ, the Euro STOXX 50 ETF, shows that Greek stocks have been in a relative uptrend against eurozone stocks since the end of January. When the news hit the tape of the German rejection of the latest Greek proposal, the relative performance chart barely budged. This kind of market action tells me that unless catastrophe were to occur, such as a Greek default or Greek exit from the eurozone, pretty much all the bad news is in Greek stocks and bonds. If you want to bottom fish, you may think about buying Greek paper, either in its debt or equities, as a speculative buy at these levels. In their discussion of the foreign economic outlook, participants noted that a number of developments over the intermeeting period had likely reduced the risks to U.S. growth. Accommodative policy actions announced by a number of foreign central banks had likely strengthened the outlook abroad. The decline in energy prices was also seen as potentially exerting a stronger-than-anticipated positive effect on growth in the domestic economy and abroad. However, the increase in the foreign exchange value of the dollar was expected to be a persistent source of restraint on U.S. net exports, and a few participants pointed to the risk that the dollar could appreciate further. In addition, the slowdown of growth in China was noted as a factor restraining economic expansion in a number of countries, and several continuing risks to the international economic outlook were cited, including global disinflationary pressure, tensions in the Middle East and Ukraine, and financial uncertainty in Greece. Overall, the risks to the outlook for U.S. economic activity and the labor market were seen as nearly balanced. There is something else that the Fed seems to have missed. What about the $9 trillion in offshore USD loans? When Group of 20 finance ministers this week urged the Federal Reserve to “minimize negative spillovers” from potential interest-rate increases, they omitted a key figure: $9 trillion. That’s the amount owed in dollars by non-bank borrowers outside the U.S., up 50 percent since the financial crisis, according to the Bank for International Settlements. Should the Fed raise interest rates as anticipated this year for the first time since 2006, higher borrowing costs for companies and governments, along with a stronger greenback, may add risks to an already-weak global recovery. The dollar debt is just one example of how the Fed’s tightening would ripple through the world economy. From the housing markets in Canada and Hong Kong to capital flows into and out of China and Turkey, the question isn’t whether there will be spillovers -- it’s how big they will be, and where they will hit the hardest. A study on dollar-denominated debt by the BIS in Basel, Switzerland, found that overseas borrowers increased issuance of dollar liabilities more in countries where interest rates were higher than U.S. yields. With American yields at historic lows for much of the last several years, the differentials provided a strong incentive to borrow in dollars instead of local currencies. China accounts for the biggest share of borrowings, amounting to $1.1 trillion, while the stock of dollar credit in Brazil totals more than $300 billion, according to the BIS report. As U.S. interest rates go up, it would become more expensive to borrow dollars. A stronger greenback means a company or government needs even more local currency to repay debt if it lacks revenues in dollars. A decade ago, the market for EM hard currency corporate bonds hardly existed. Today, it is bigger than the US high-yield corporate bond market, an asset class familiar to investors for decades, and more than four times the size of Europe’s high-yield bond market. What has driven such extraordinary growth? In just a few years before the global financial crisis of 2008-09, emerging markets won over the world’s investors. In 2001, Goldman Sachs identified the Bric economies — Brazil, Russia, India and China — as the new engines of global growth. Chinese demand drove a commodity boom that helped billions of people rise out of poverty and into the consuming classes. After the crisis, the developed world’s expansionary monetary policies kept the party going, pushing cheap credit to EM consumers and sending ever more foreign money into EM assets. Emerging companies, many able to tap overseas markets for the first time, embarked on a borrowing spree. Yield-hungry foreign investors were happy to help. David Spegel, global head of EM sovereign and corporate bond strategy at BNP Paribas, has been following hard currency EM corporate bonds since 1994. His figures show that the value of such bonds in the market has grown from $107bn then to more than $2tn today. But with Brazil’s economy imploding, China slowing and dark shadows over markets from Venezuela to Russia and Ukraine, some analysts worry that the party has gone on too long. Stuart Oakley, global head of EM foreign exchange trading at Nomura in London, points to how easily things could go wrong. “It is entirely possible that we could see a default by a big, emerging market commodity exporting corporate,” he says. 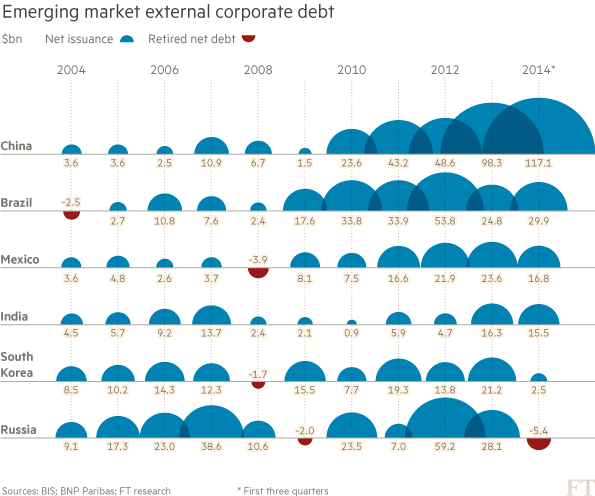 As the chart shows, EM external corporate debt has skyrocketed over the years. What about the liquidity concerns voiced by FOMC staff over mass mutual fund redemptions, wouldn't an EM bond market rout be even worse? Shifting to data for the end of 2013, only $2.3 trillion ($2.1 trillion) out of the $8.6 ($7.6 trillion) in dollar claims on non-banks (non-financials) outside the US were held in the US (Graph 3, middle two arrows). In other words, offshore holdings represent almost three-quarters of the dollar credit extended to non-financial borrowers outside the US. But the key point the authors were making, which continues to be ignored by the world and his dog, is that the primary source for most of the world’s external dollar debt has been non-US banks operating outside the US, which have trillions of dollars of deposits for swapping into other currencies for and non-US asset managers sitting on similarly large levels of dollar assets. This, in their opinion, totally undermines the popular theory that the Fed’s large-scale asset purchases inject liquidity into banks in the US, which they in turn extend to offshore banks, which lend the dollars further. This, de facto implies that the vast majority of the external dollar debt position is funded by an independent dollar float that sits separate to the US dollar system, but which depends on trade flows from the true US dollar system to be funded. To us, that suggests the more QE the US did without issuing a commensurate amount of its own debt because of, you know, debt ceiling, the more it encouraged the external US dollar float to be relent multiple times (fractional reserve style) abroad before finally being soaked up by the sort of SWFs that would reinvest that float in US domestic assets. But we’re now at a point where, unless all those external debtors have an organic way to keep dollars flowing into their coffers — i.e. without dependence on financing from non-US dollar pool sources — the value of all those loans, as well as the external US dollar pool itself, could quite abruptly and violent collapse in value. One somewhat novel theory is that sharply lower crude prices might have something to do with the change in the technicals. It seems plausible to us that lower crude prices have led to a slower rate of petrodollar accumulation by oil-exporting countries and less recycling of those funds back into global financial markets—amounting to a non-negligible retraction in liquidity. There’s little doubt the petrodollar bid for fixed income securities has been tremendous during the last five years. The FX reserves of OPEC members have increased nearly 60% since 2009 to more than $1.3tn—a figure that would surpass $2tn if certain non-OPEC members, like Russia, were included. Likewise, sovereign wealth funds that are primarily funded by crude sales have increased nearly 80% over the same time period to more than $4tn (see figure). Taken together, the AUM of petrodollar investors has increased by $2.5tn in the space of 5 years, or roughly $500bn per year. The current environment leaves a number of EM economies highly vulnerable to the triple whammy of a strong USD, rising interest rates and worsening USD liquidity and falling export earnings because of lower commodity prices. The chart below shows the tight correlation the EM equities (EEM) have had with the USD and industrial metal prices. EEM is now experiencing a negative divergence with these indicators, which leaves this asset class vulnerable to more price weakness. As the bottom figure suggests, many of the same countries are likely to be in the firing line – in particular, Ukraine, Turkey, South Africa, Peru, Brazil, Indonesia, Colombia, Mexico, and India. Of these, only Ukraine has seen a significant improvement in its current account deficit, which has fallen from a whopping 9.2% to 2.5%. Poland and Romania have moderate (2%) but higher deficits, and could receive a larger jolt this time around. Only Thailand has moved into surplus, and looks likely to be spared. In addition, I am concerned about the possible effects on China. The BIS study estimated total USD offshore loans to China, which includes government and corporate borrowers, to be $1.1 trillion - that`s not an insignificant amount. 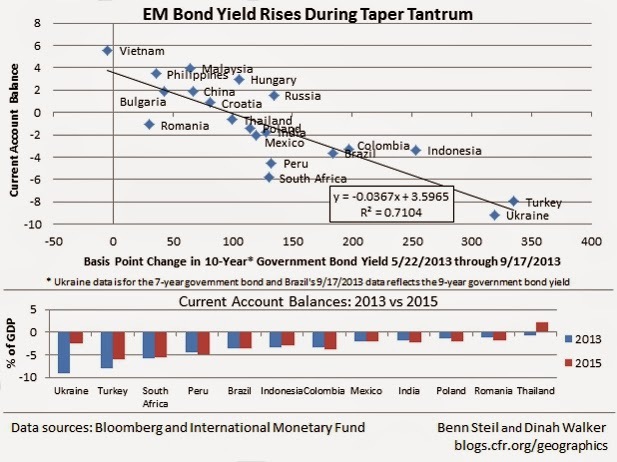 So far, neither the EM bond markets nor equity markets have been spooked by the prospect of Fed tightness. Nevertheless, I was surprised by the tone of the FOMC minutes as the Fed does not appear to have considered this second-order effect tail-risk to the global financial system. On Friday, the SPX staged an upside breakout to an all-time high. 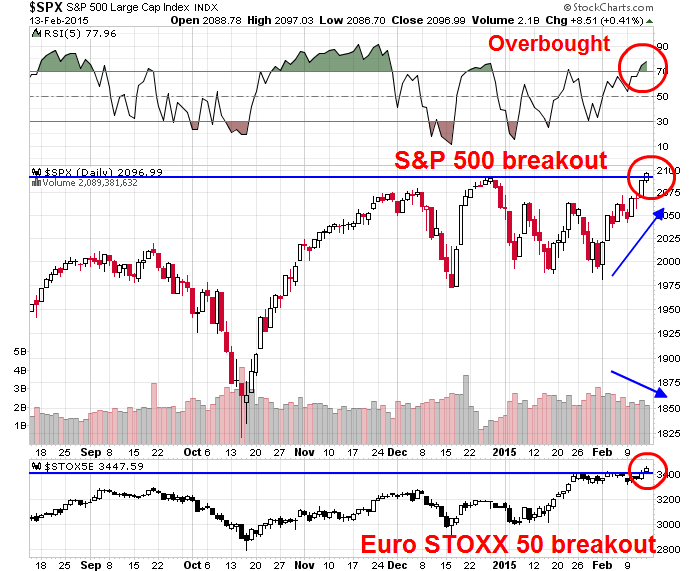 A similar breakout was observable in European equities, as measured by the Euro STOXX 50. While the SPX breakout was accomplished on diminished volume and the 5-day RSI is overbought, these warning signs are not necessarily fatal to an advance as all-time highs are generally interpreted bullishly. Macro environment: The macro environment is highly headline driven with binary results, especially in Europe. This creates a high degree of volatility and uncertainty. 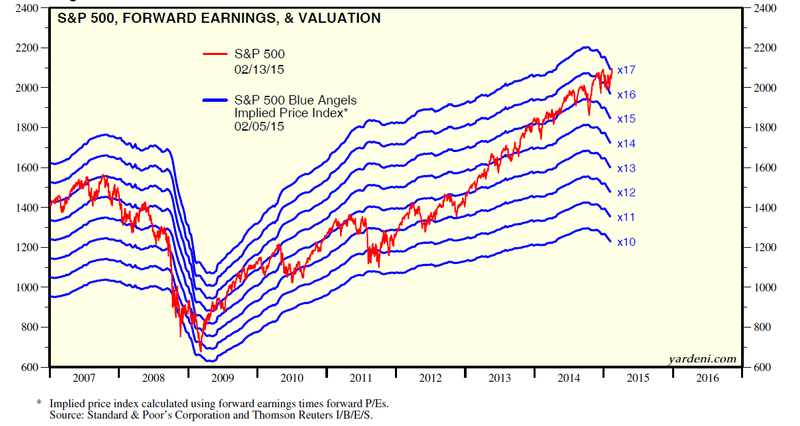 Fundamentals: Valuations are stretched and the fundamentals continue to deteriorate, as forward EPS are still declining. 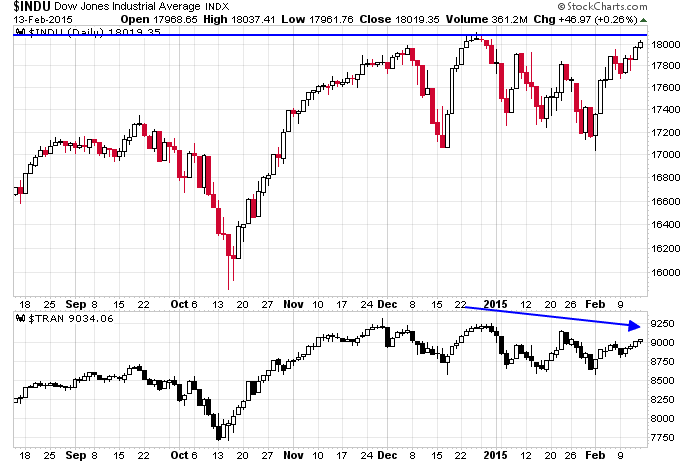 Technical: I am seeing signs of negative divergences, particularly in a number of breadth indicators. 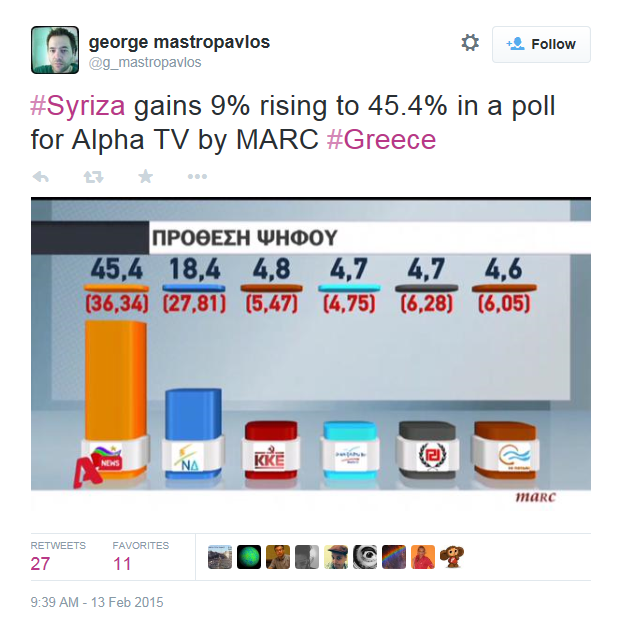 Greece: A repeat of 2011? The current macro environment is somewhat reminiscent of 2011. Then, the markets were beset by uncertainty over Greece and a political impasse in Washington. The summer of 2011 saw endless summits and emergency eurozone meetings of ministers - until the ECB came to the rescue with its LTRO program. Today, Greece is in the headlines and we seem to be bound for endless meetings and summits yet once again. The UK is holding an election on April May 7, with uncertain results that could lead to an ungovernable Britain, or worse still, the specter of Brexit from the EU. In addition, the markets are nervous over the timing of the Fed`s rate hike, which could put additional strain on global markets. As a result of the uncertainty, the markets chopped around in 2011 in trading ranges. It then either broke down or rallied upwards, depending on the headline news which were highly unpredictable and binary in nature. If 2015 is 2011, then the big question becomes, "Where are we in the 2011 analogue?" The EU recognizes that if it were to bend too far to Greece, it would encourage anti-European parties in other member states. Greece is getting little sympathy from other Club Med countries. See this statement from Portugal with the tone of "we took our medicine, now take yours". The Irish have also taken a hard line on Greece. 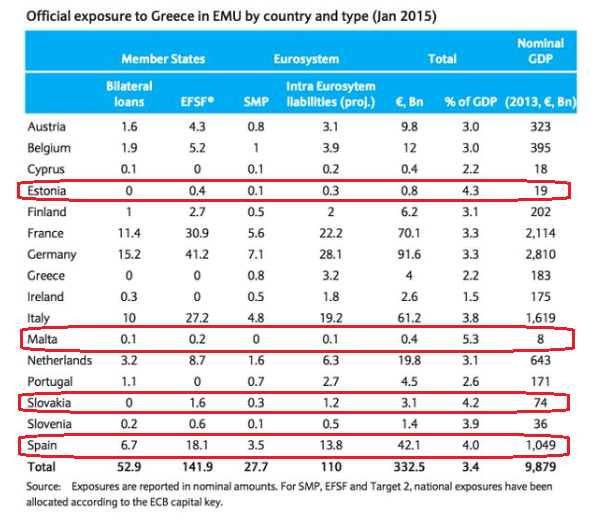 The chart below shows the official exposure to Greece by country. The average exposure is 3.4% of GDP and I have highlighted the countries with exposure at 4% of GDP or more. It may be very well and fine to talk about the Germans paying for Europe, but I have highlighted, but is it realistic to ask Estonia, Malta, Slovakia and Spain to pay for Greece? The collision of these forces will necessitate some grandstanding and brinksmanship that will undoubtedly create lots of up-and-down market volatility in the days and weeks to come. 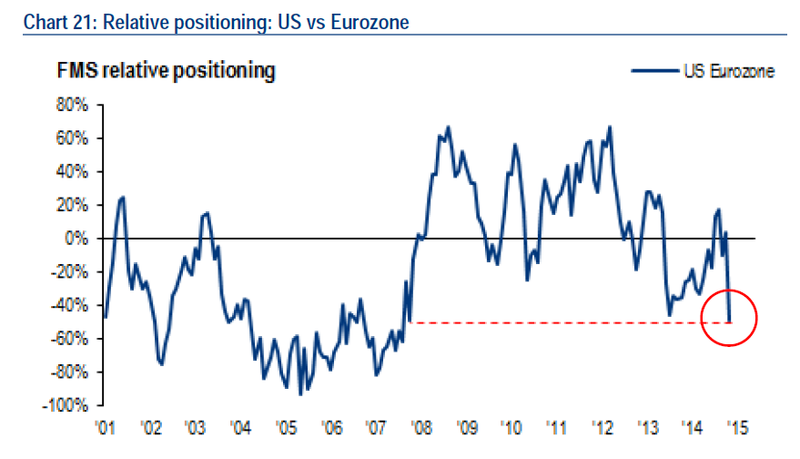 Don`t expect this European drama to end quickly. Will Brexit risk spook the markets? Current Tory prime minister David Cameron has vowed that, should he be re-elected, he would hold a referendum before the end of 2017 on whether the UK should remain in the EU. The latest report from the FT indicated that UK Conservatives look at bringing forward EU referendum to 2016 should they win the election. If Britain votes to leave the EU the political shock is likely to reverberate for years, throwing into question not only the UK’s place in the world but also the very survival of its own national union. What are the political ramifications of Brexit? The first is that the referendum, which David Cameron has promised to hold by the end of 2017, will split his Conservative party — one of the world’s most successful election-winning machines. The stakes could scarcely be higher. Britain’s general election on May 7 will be watched with particular interest in other national capitals. For Britain, Brexit could be just the start of a process that redefines the country in the 21st century. As we approach the UK election, watch for the market to start pricing in a Brexit scenario - and that won`t be pleasant for risky assets at all. 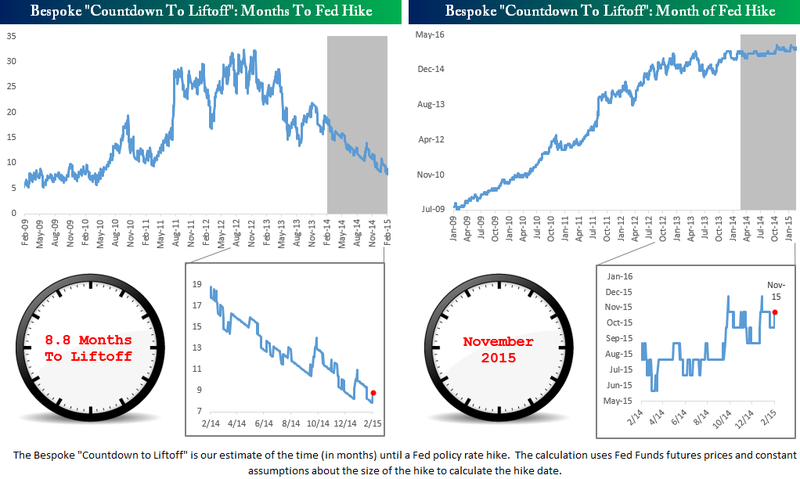 Market expectations vs. the Fed, who wins? The Fed's expected policy path, and any desire for an even more aggressive policy path pushed by some market participants, is at odds with a secular stagnation scenario. But it appears something similar to that scenario is price into bond markets. If the Fed is not open to such a scenario, they risk tightening too aggressively and turning an expansion that should last at least four more years into one with only two left. Based on the signals given by Fed officials so far, a June interest rate liftoff seems to be in the cards, but market expectations are that the Fed will not raise rates until late 2015 or perhaps 2016. Should Yellen "correct" market expectations in her Congressional testimony or if the markets get "corrected" it its perceptions when the FOMC minutes are released on Wednesday, it has the possibility to send stock and bond prices into a tailspin. 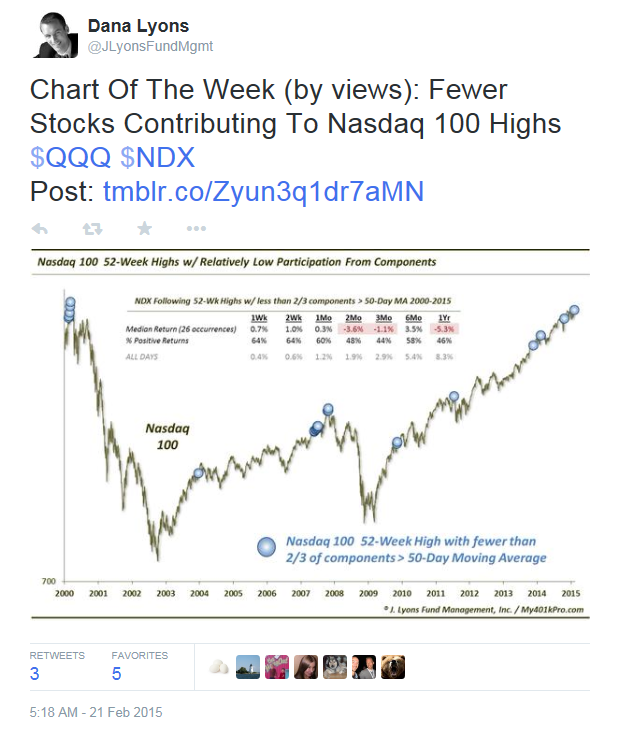 Another reason for me to doubt the Trend Model`s bullish signal is the poor performance of equity fundamentals. To repeat, stock prices advance if either the E in the PE ratio rises, or the PE ratio expands. 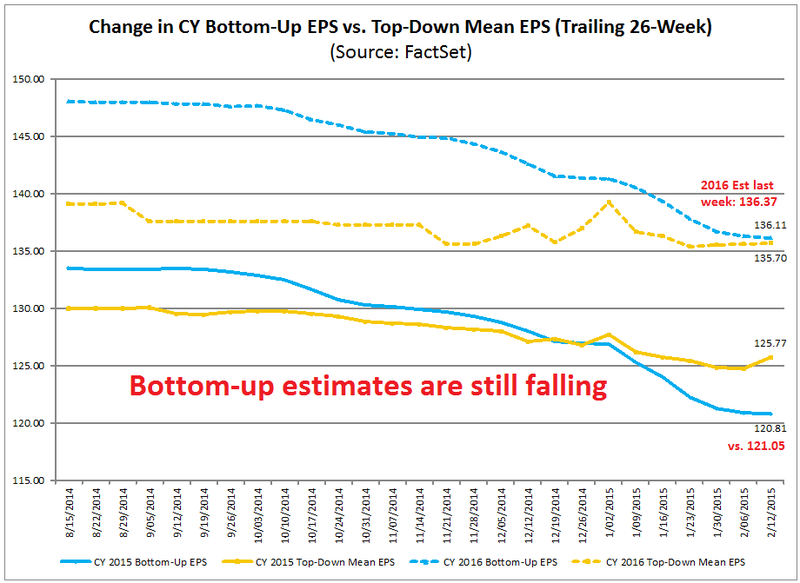 The latest report from John Butters of Factset indicates that forward EPS estimates are still falling and the first half of 2015 is looking ugly. With 391 of the SPX having reported (and therefore Earnings Season largely over), we have seen an extraordinarily negative guidance ratio. 63 companies have issued negative guidance for Q1, compared to 11 with positive guidance. In the last week, we have seen 11 companies with negative guidance, compared to 1 with positive guidance. EPS growth rates continue to decline. Estimated YoY Q1 2015 EPS growth rates came in -3.6% (vs. -3.1% last week) and -0.7% for Q2 2015 (vs. -0.4% last week). As the chart below shows, bottom-up derived EPS estimates for 2015 and 2016 continue to decline on a weekly basis (annotations in red are mine). In addition, analysis from Bespoke indicated that we may be entering a period of negative seasonality from the US macro data. 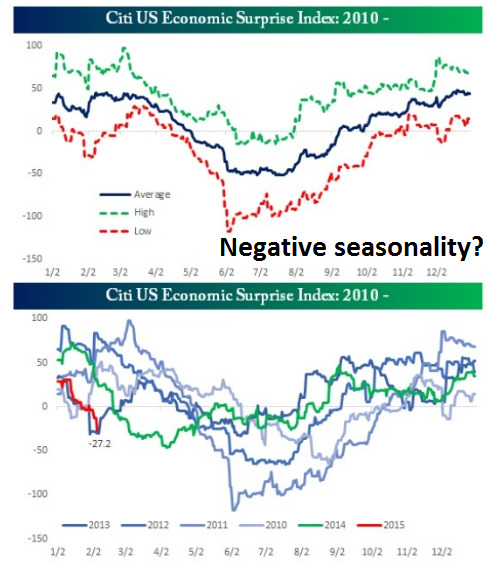 Historically, the Citigroup US Economic Surprise Index, which measures whether economic releases are beating or missing consensus estimates, has displayed a negative seasonal pattern every Spring. Should the macro data continue to follow this pattern, it may create headwinds for forward EPS estimates. Against this backdrop of weak EPS expectations, Ed Yardeni also showed that stocks aren't cheap. The chart below shows that as the market advances in the face of falling EPS estimates, forward PE ratios have risen to levels not seen in the last 10 years. The Fed initiation of a tightening cycle will only add pressure for PE ratios to contract. I also have some technical concerns, mainly due to a number of negative divergences exhibited by some breadth indicators. The middle panel of the chart below shows the SP 1500 advance-decline percentage, which is smoothed by a 20 day exponential moving average. The bottom panel shows the percentage of stocks in the SPX showing a buy signal on the point and figure chart. The combination of the negative divergence in these two indicators, the SP 1500 A-D and % SPX bullish, have signaled weakness in the past. 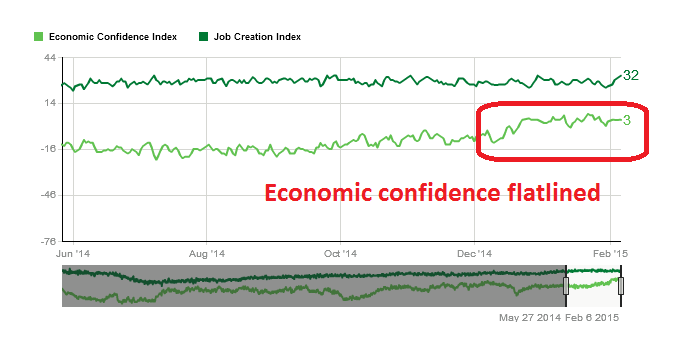 The last time these indicators showed a negative divergence was (surprise!) the sideways consolidation period in early 2011. As well, a number of short and medium term indicators from IndexIndicators.com are flashing warning signs. 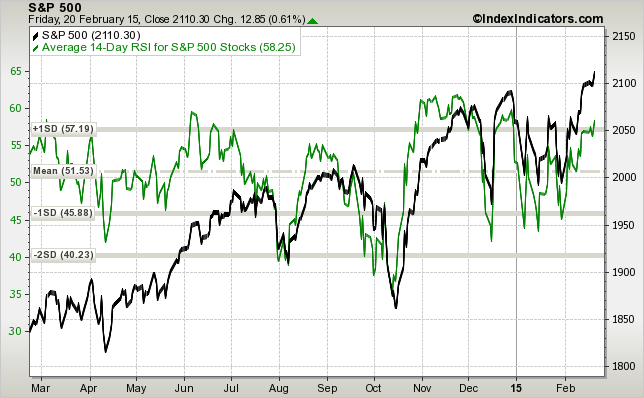 For example, the chart below shows the % of stocks in the SPX with an RSI-5 above 70 (green line). The signal from this very short-term indicator could be interpreted in one of two ways. On one hand, the series of lower lows and lower highs are indicative that, even though the market has gone to all-time highs, this indicator is still relatively low and not overbought and therefore stocks could go higher. On the other hand, it is telling a story of a loss of momentum and negative breadth divergence, which is bearish. The chart below of the average 14 day RSI in the SPX also tells the story of lower lows and lower highs - another negative divergence. 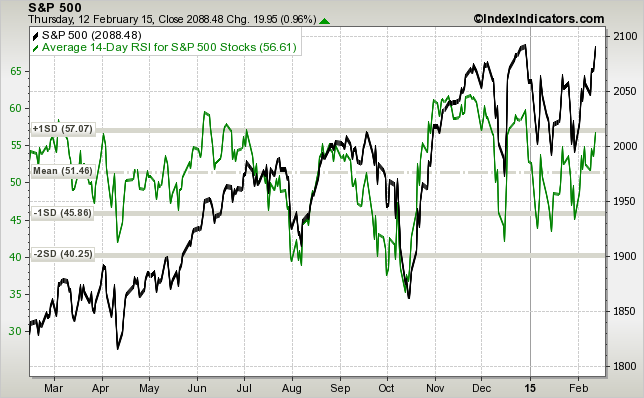 This chart of the stocks above the 20 dma also shows a negative divergence and loss of momentum. I could go on, but you get the idea. In addition, while the NASDAQ and Russell 2000 also rallied to new highs on Friday, the inability of the Dow Jones Industrials and Transports to hit new highs creates concerns. 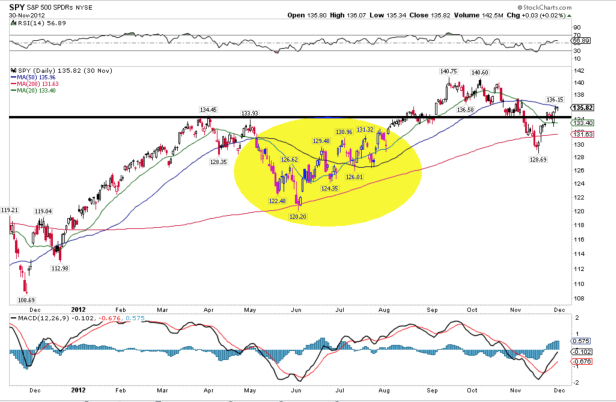 It raises the issue highlighted by Mark Hulbert of the Dow Theory sell signal, which has been flashed by two of the three Dow Theory strategists that he follows. Every day, investors and traders have to make decisions based on incomplete or contradictory data. You can create a model and stick to its discipline, but you also need to conduct periodic "sanity checks" to recognize the limitations of the model. My reservations about the Trend Model buys signal is the result of that "sanity check". This is a very tricky market that may not be conducive to the use of trend following models, which are all washed up until macro trends re-emerge and re-establish themselves. My inner investor remains nervous, but he is sticking to his benchmark asset allocation of stocks and bonds. He is not getting more aggressive, nor is he getting more defensive. My inner trader remains short this market. He is well aware of the concerns over the limitations of the Trend Model, but he is also cognizant of the power of the Trend. All-time highs are rarely bearish events. Which is correct, the discipline of the Trend Model, or the "sanity checks" of the bearish influences that the model doesn't capture? I have no idea. My inner trader is therefore waiting for further confirmation of stock market strength next week. Should the market break further upwards, he will cover his shorts and reverse his position to the long side. 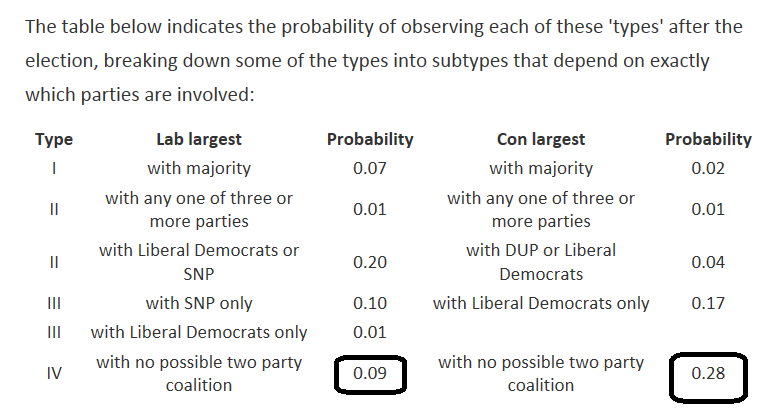 Correction: The UK election is May 7, not April 7. If you fall in love, your experience isn't that unique. Even Facebook knows the signs. As oil prices have begun to stabilize, there has been a lot of opinions as to whether oil has bottomed or not. I thought that I would throw in my 2c worth on why I believe the path of least resistance for oil is still down. 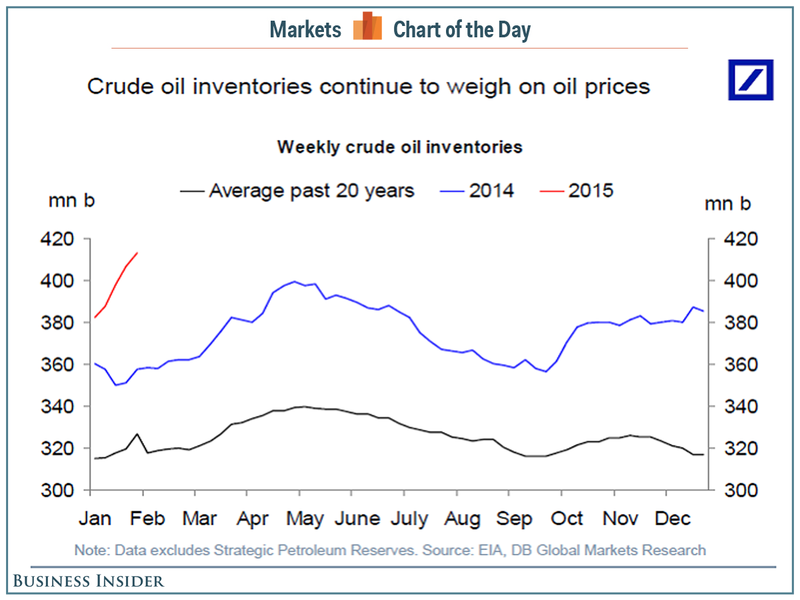 Let's look at other drops in oil over the past 30 years. Below is a monthly chart of crude oil (WTIC). The yellow bars are the size and duration as the current fall in oil since June 2014. Three other instances look similar in that the drop was swift and without a pause (marked with stars: 1986, 1990 and 2008). Two others took twice to four times as long to unfold (1997 and 2000). He pointed out that bottoms tend to be a process. 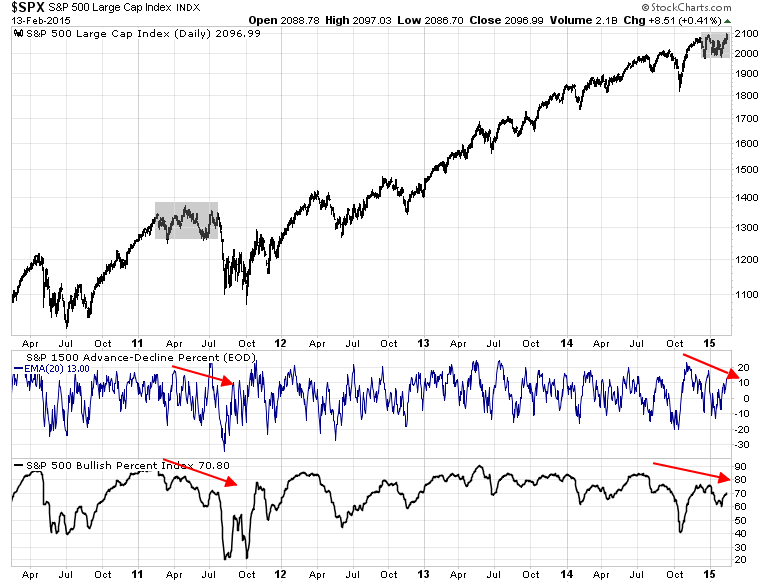 If the recent rally is the first phase of a bottom, then rallies are typically capped by the 50 day moving average. Prices then weaken and then re-test the previous low, sometimes successfully and at other times undercut the low. The key feature of a bottom is a positive MACD divergence. The most often quoted price is the front month, which closed at 49.45. If you look out six months, however, the price is 56.43 and the 12 month price is 60.01. 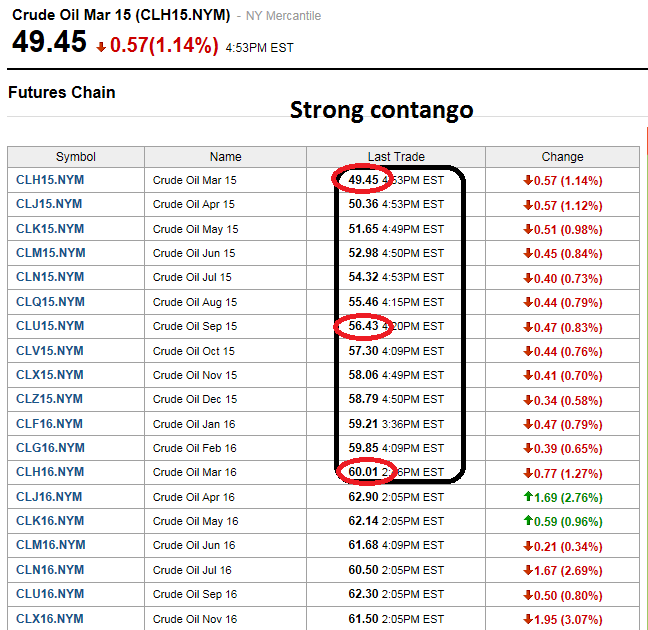 This upward sloping contango means that any trader with storage could buy oil at 49.45 for delivery, hold it and then sell it in six months for 56.43 for a tidy 14.2% profit (less carrying costs). A 12-month buy-and-hold will get you 21%. The contango has created two effects. First, oil producers typically hedge their production with a 6 or 12 month strip contract (e.g. 12 month strip = 1/12 of 1st month + 1/12 of next month + ... ). The actual realized hedged price is about 10% higher than the often quoted front month contract. In that sense, things aren't as bad as the headlines sound. Bottom line: Don't expect the current oil rally to be long lasting or sustainable. I have no idea whether the mid-40s level seen in the most recent swoon was THE BOTTOM for oil prices, but my inkling is that the near-term direction for oil is down. What's next for the American consumer? This Thursday, we will see the Retail Sales report. Despite the drop in energy prices, retail sales haven't exactly been setting records. 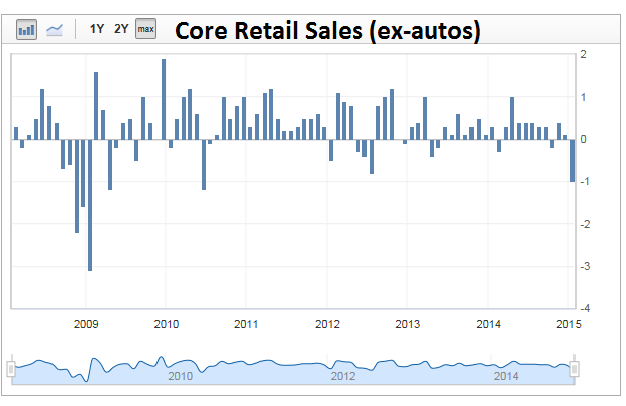 The Street estimate for MoM Core Retail Sales (ex-autos) is -0.4%. 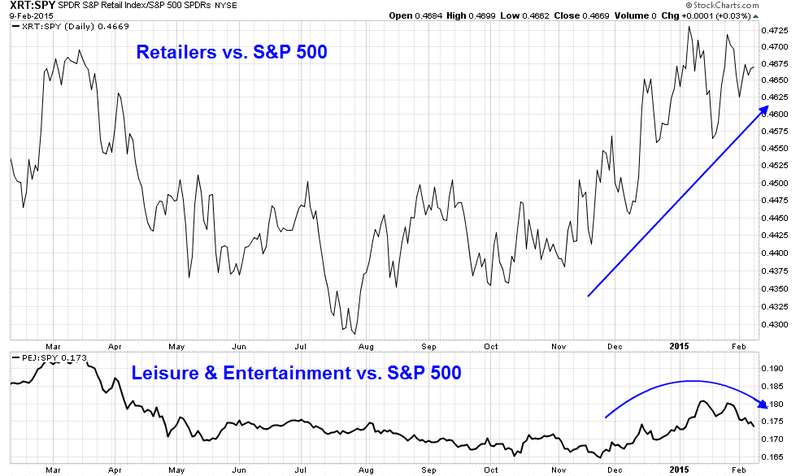 On the other hand, retailing stocks have been in a solid relative uptrend when compared to the market. The bottom panel shows the relative performance of the Leisure and Entertainment group, which seems to be starting to roll over. What's happening to the American consumer? 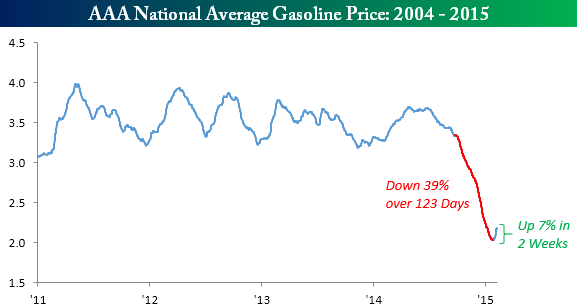 Where are the savings from lower gasoline prices? Plunging prices are encouraging Americans to drive more often and buy more trucks. At the same time, faster economic growth and a big influx in hiring over the past year means more Americans are now taking part in the daily commute. The result: sharply higher demand for gasoline, argues Nicholas Colas, chief market strategist at ConvergEx. “We’ve finally discovered where American consumers are spending some of the savings from lower gasoline prices: they are buying more gasoline,” he said in a new report. For one thing, Colas points out the amount of gasoline supplied to the U.S. market was up 6.3% in January compared with a year earlier. As gasoline prices have ticked up in the last couple of weeks (chart via Bespoke), what will happen to consumer confidence, which will get released on Friday? As the above chart of relative performance of retailing stocks indicates, expectations are rising for consumer spending. Watch this space for possible disappointment.